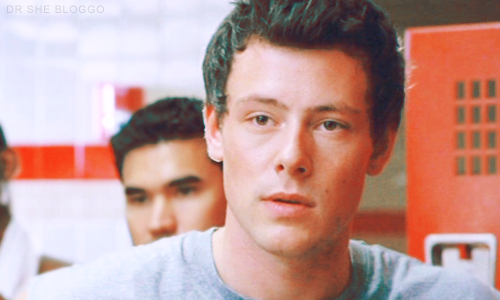 Like it or not, it’s undeniable that Finn Hudson is a pivotal character in the show. He is introduced in the pilot as the catalyst; he joins Glee Club, and the merry band of misfits suddenly doesn’t look so pathetic anymore. Finn adds that little bit of ethos to the mix, providing some well-intentioned leadership, and is the original proof that just because you’re popular doesn’t mean you have to be a jerk to the “losers.” The show draws a line between the cool kids and the Glee kids, and Finn is the first one brave enough to cross that line. Understandably, this makes him a hugely important character within the construct of the story. It’s why he’s a main character, and a likeable one at that. And, considering the original intent of the character, that’s how it should be. The show sets up the conceit that this boy, even though he’s popular and athletic and a little bit awkward and untrained, has something inside him that makes him special. That makes him happy. The whole point of the character is that he’s discovering something about himself. He wholly embodies the message of the club: it’s about opening yourself up to joy. And when Finn opened himself up to the Glee Club, it kicked off the whole show. He is the original proof that there is a “Gleek” in all of us, and that we should embrace it. So why, oh why, halfway through Season 2, is Finn still fighting the feeling? The writers have completely undone any and all original intent the character had. Finn fought the feeling for oh, maybe the first thirty minutes of the pilot, and then devoted himself to Glee Club, to joy, to his self-discovery. His arc kept fairly true to this construct through the First 13 episodes, and then suddenly, in the Back 9, things started to go south. Every moment where Finn becomes wildly unlikeable can be traced back to the notion that the writers are unraveling the progress he’s made as a character simply to forward a plotline, accommodate a musical number, or support an episode theme. Sometimes I even wonder if they just plain old forgot how to write the character. Regardless, it’s maddening to see this happen. Because it takes the first character who opened himself up to joy, and drags him through the mud for rather trivial reasons. Finn’s arc is one of self-discovery. At the end of the day, all signs need to point to the fact that Finn is learning who he is, and that Glee has made him happier than he’s ever been as a result. Singing should bring him joy. The Glee Club should be important to him as a result. And unfortunately, the writers are completely ignoring these details when writing his character.